Welcome to lesson 1(!) 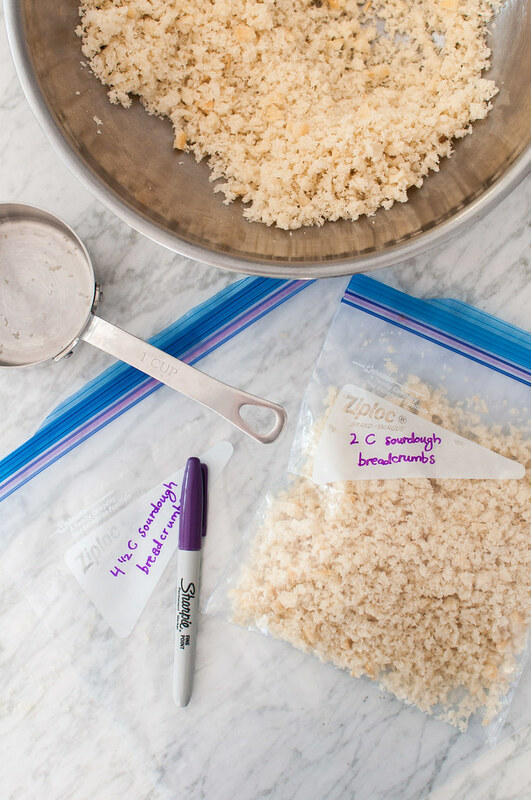 of the homemade how-to series: how to make fresh bread crumbs. Every two weeks, I’ll break down the steps for a home cooking skill I searched for often as I learned to cook. A recipe to showcase your new skill will follow a couple days after the how-to post! Chances are, you searched for this post in a pinch, so let’s dive right in! Click here to jump down and read more about fresh bread crumbs and how to use them. Food processor: I have this one, which I purchased at Costco, and I love it. For a slightly smaller and less expensive model, I like the looks of this one (it’s under $35). Serrated knife: makes crust removal super easy. Use a serrated knife to remove bread crust. For a round loaf, remove the crust by cutting the loaf in half top to bottom (then pause to smell the fresh, yeasty bread). Stand each half on its cut side. Cut off the bottom, flat crust first, then work in smaller sections with the knife, “peeling” the remaining crust off the bread. To remove crust from sliced bread, stack the slices and cut top to bottom to remove crusts from all the slices in one motion. See the FAQs below if you’re wondering why we discard the crust (or save it for the dog). Cut or tear bread into approximately equal chunks, about 1 to 2 inches each. 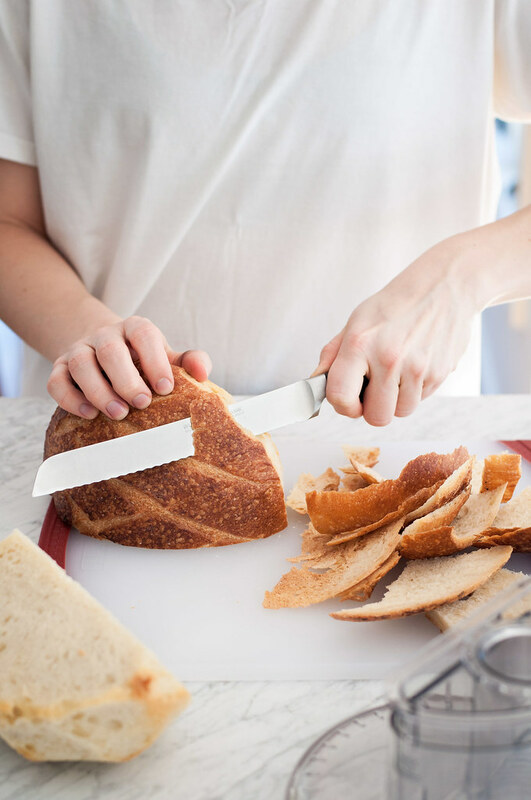 To ensure equal sized chunks and to work quickly, use the serrated knife to thickly slice the bread, then stack slices and make crosswise cuts to get squares. Fill food processor about half full of bread chunks (work in batches if all the chunks won’t fit). Pulse the bread chunks in 5 to 10 second bursts until you reach the desired crumb size. You shouldn’t have to open the food processor to scrape down the sides or stir. When a recipe doesn’t specify crumb size, aim for just smaller than a peppercorn, with a few larger or smaller pieces. Err on the larger size to avoid ending up with bread powder. If not using right away, store crumbs in resealable freezer bags, labeled with the quantity of crumbs inside. Squeeze out most of the excess air as you seal, without crushing the crumbs at all. Even if you store all the crumbs in a large bag, they’re easy to break up when frozen so you can thaw only the quantity you need. Thaw in a sealed container at room temperature or in the refrigerator, so the crumbs don’t dry out. To show the recipe as a list of numbered steps, click the "Print" button in the upper right! 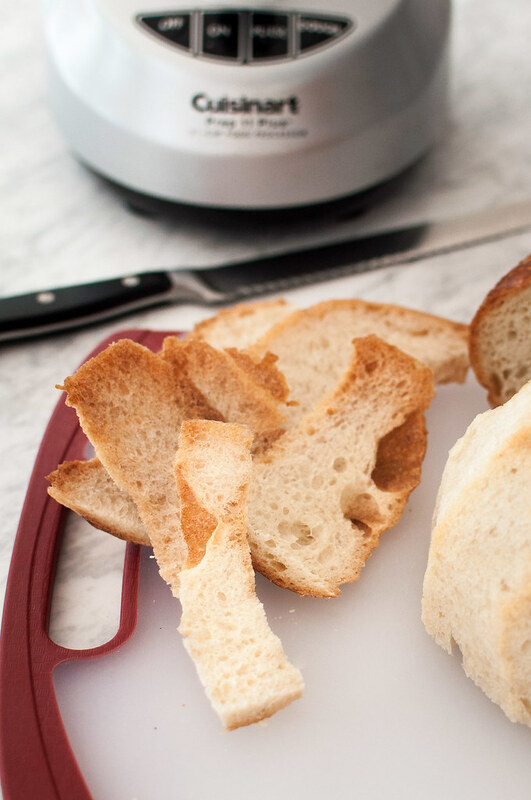 Use a serrated knife to remove bread crust. For a round loaf, remove the crust by cutting the loaf in half top to bottom (then pause to smell the fresh, yeasty bread). Stand each half on its cut side. Cut off the bottom, flat crust first, then work in smaller sections with the knife, "peeling" the remaining crust off the bread. To remove crust from sliced bread, stack the slices and cut top to bottom to remove crusts from all the slices in one motion. 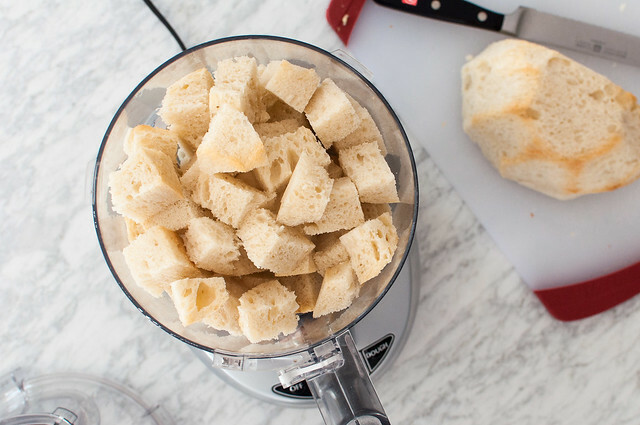 Cut or tear bread into approximately equal chunks, about 1 to 2 inches each. 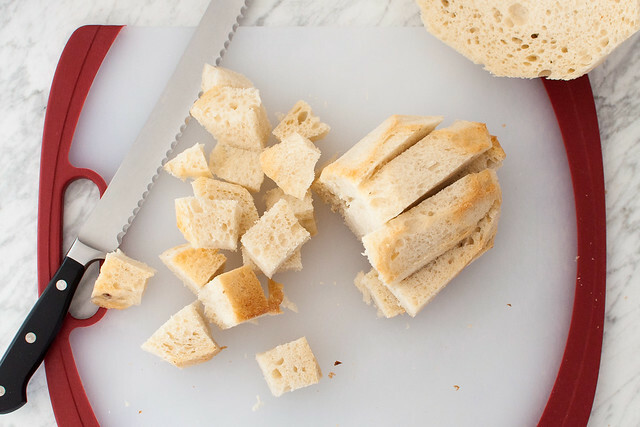 To ensure equal sized chunks that can be made quickly, use the serrated knife to thickly slice the bread, then stack slices and make crosswise cuts to get squares. Fill food processor about half full of bread chunks (work in batches if all the chunks won't fit). Pulse the bread chunks in 5 to 10 second bursts until you reach the desired crumb size. You shouldn't have to open the food processor to scrape down the sides or stir. When a recipe doesn't specify crumb size, aim for just smaller than a peppercorn, with a few larger or smaller pieces. Err on the larger size to avoid ending up with bread powder. If not using right away, store crumbs in resealable freezer bags, labeled with the quantity of crumbs inside. Squeeze out most of the excess air as you seal, without crushing the crumbs at all. Even if you store all the crumbs in a large bag, they're easy to break up when frozen so you can thaw only the quantity you need. Thaw in a sealed container at room temperature or in the refrigerator, so the crumbs don't dry out. My 1½ pound, 7 inch diameter, very dense loaf of sourdough yielded 9 cups of crumbs. 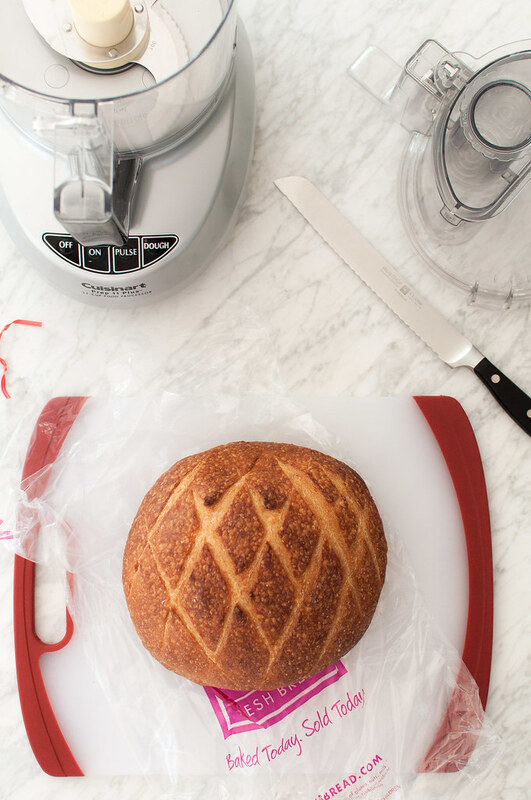 Weight of the loaf is the most predictable guide for your yield of crumbs. 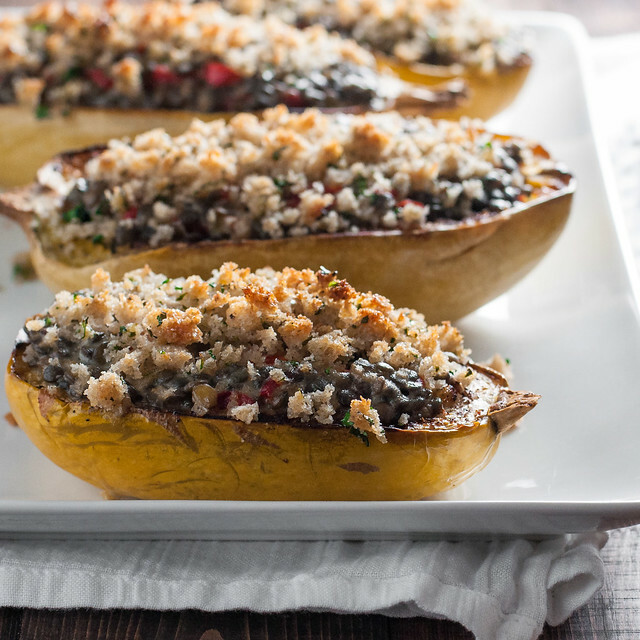 Here’s this installment’s recipe post: rainbow peppers with herbed breadcrumbs. It’s easy to run to the store for Panko or Italian-style dried bread crumbs. They usually come in a resealable container perfect for the pantry. But what does a recipe mean when it lists “fresh bread crumbs” as an ingredient? 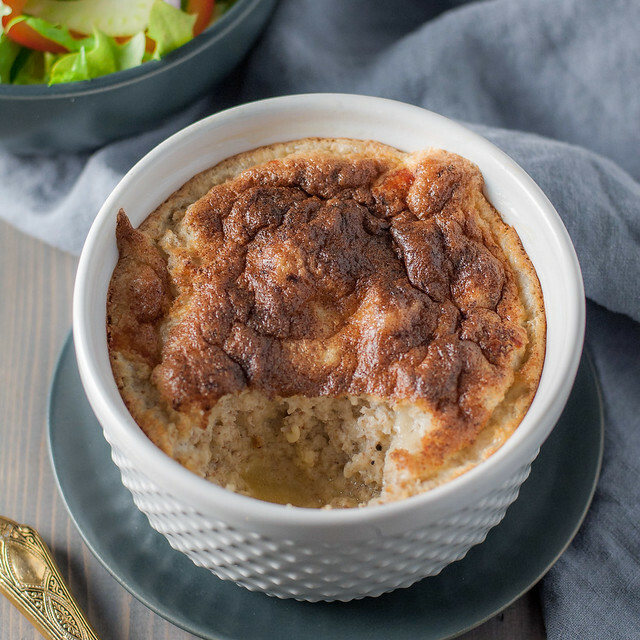 I came across this a lot as I worked my way through a year’s worth of gratin recipes, so I feel like a sufficient expert to share my knowledge with you for the first official post in NCK’s new “homemade how-to” series. 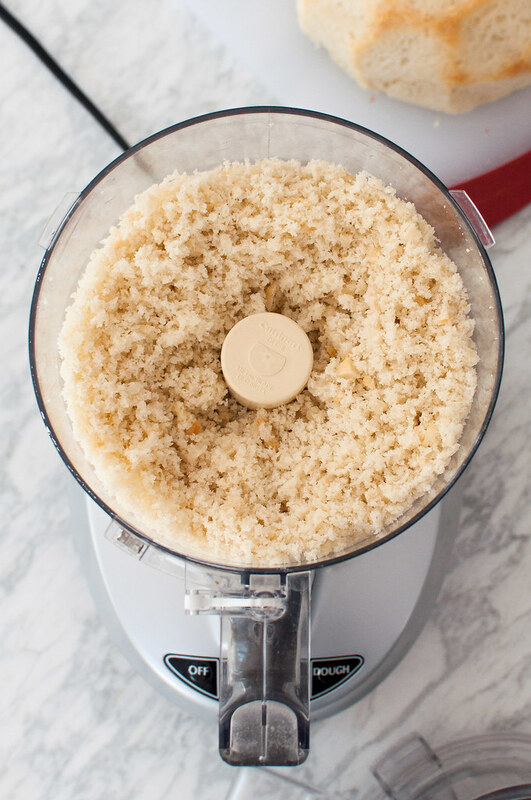 Since they freeze so well, homemade bread crumbs are a versatile use for bread that’s on it’s last legs of freshness. 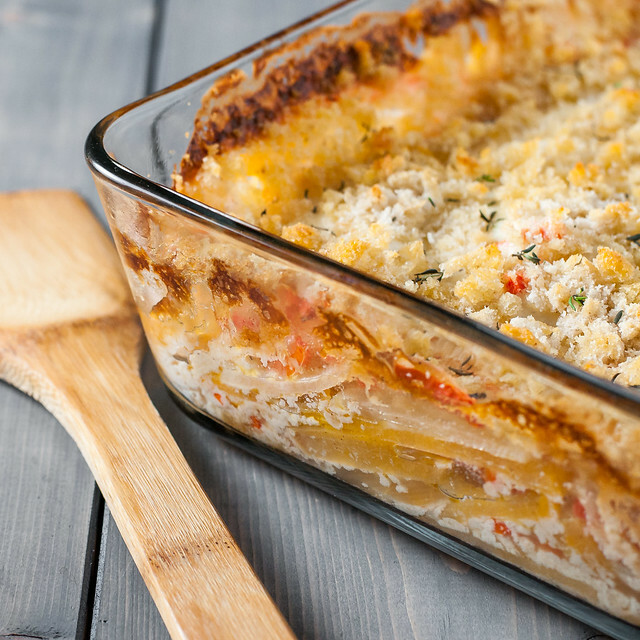 Crumb quality won’t suffer, and you’ll have crumbs at the ready for your next gratin, salad, or casserole topping! Do I have to remove the crust? 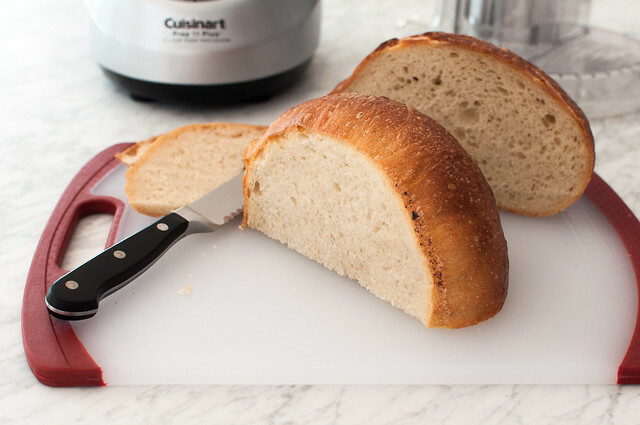 The crust is VERY difficult to process in the food processor, especially from a crusty loaf like sourdough. 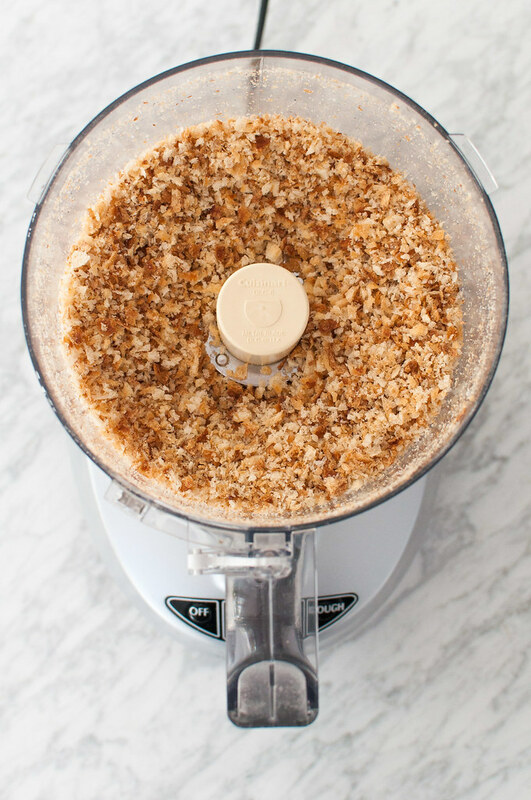 It takes longer and the food processor works so hard that the crumbs can actually heat up. If you want to reduce waste and process the crust into crumbs, which I fully support, do it separately from the rest of the bread. Crust crumbs would be best to dry out, process even finer, and use as a breading, or to toast and use as a crunchy salad topping. What kind of bread should I use? French bread/baguette: The baguette and other narrow loaves have a high crust to bread ratio. For all the work you’ll do removing crust, the yield of breadcrumbs will be low. However, if it’s what you’ve got and you need crumbs, the inside of the loaf should produce good crumbs. Softer loaves: For example, sandwich bread. These loaves, especially wheat, are lighter with a thinner, softer crust. They’ll definitely still work for bread crumbs, but slightly stale bread is your best bet in this case. Some of the moisture will have left the bread, reducing the chances that you’ll end up with crumbs that stick together in the food processor. Post other questions in the comments below, and I’ll get back to you shortly! The more lengthy background story is here, but in summary, I’ll guide you through a cooking skill that you might not know, or that you might find yourself looking up every time you encounter it in a recipe, much as I’ve found with the skills I’ll share. Whether it’s brand new to you or a refresher, pin or bookmark it for quick reference. But, the best part of the series, in my opinion, is the recipes that go with it. 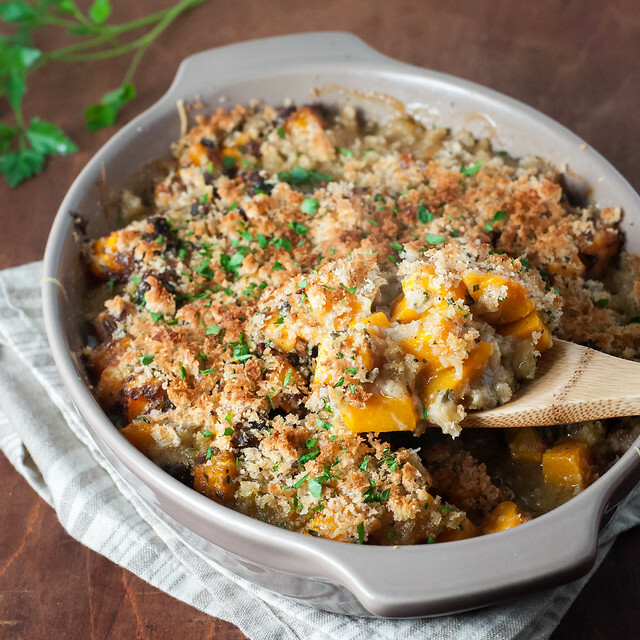 Let’s be honest: pictures of how to make breadcrumbs are not all that colorful or exciting, but the recipe for rainbow peppers with herbed bread crumbs? Much more tantalizing. I hope you find the series useful and educational! If there are any topics you’d really like covered, or things that you found confusing, let me know in the comments below. I can’t wait to hear from you. This page contains affiliate links to products on Amazon I trust and, often, use every day in the kitchen. 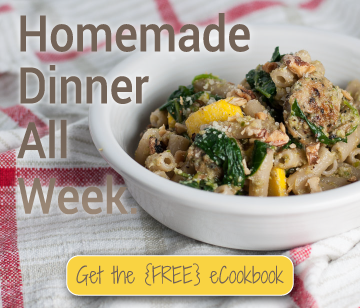 There’s no extra cost for shopping via these links, and a small portion of each sale helps to bring more Homemade How-To’s to NCK!